Why our answer to the Better Together Constitutional Amendment Proposal is NO! I ask that you vote No, on a Constitutional Amendment for November 2020, proposed by Better Together (a non-profit group, sponsored by Billionaire Rex Sinquefield, whose members for the most part, are not from the St Louis Area). Taking out the emotional factors of this proposal, i.e. 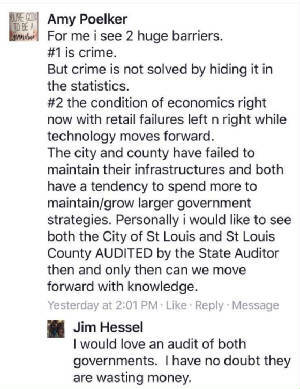 ; said fragmentation being the cause of St Louis City’s failed Economic Development, it’s Crime/Murder rate, it’s failing Infrastructure, the fact that 40% of their land is not taxable cause its tied to nontaxable entities like hospitals, colleges, government buildings, charities, shelters, schools. The fact that their leadership has given away much of their remaining tax opportunities through TIF’s (the City of St Louis has just over 150 Tiff’s within its boundaries). As a matter of fact, the proposal states that any changes to the new “Metro City” Charter, (which is developed by 2 people-Stenger and Krewson) can only be changed by a 2/3 vote of the Metro City Council. 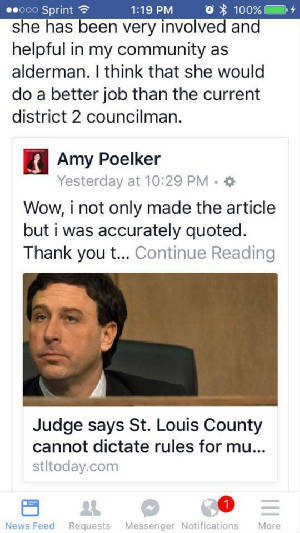 The Metro City Council is (a 33-person council, where for the 1st two years is UNELECTED and Appointed by the Mayor Only-Stenger, (can’t imagine that this appointed council would object to a Charter put together by the very person that gave them their new position). By the way this document also states that the Metro City’s 1st Mayor will be the individual that was in the St Louis County Executive position on January 1st, 2019. 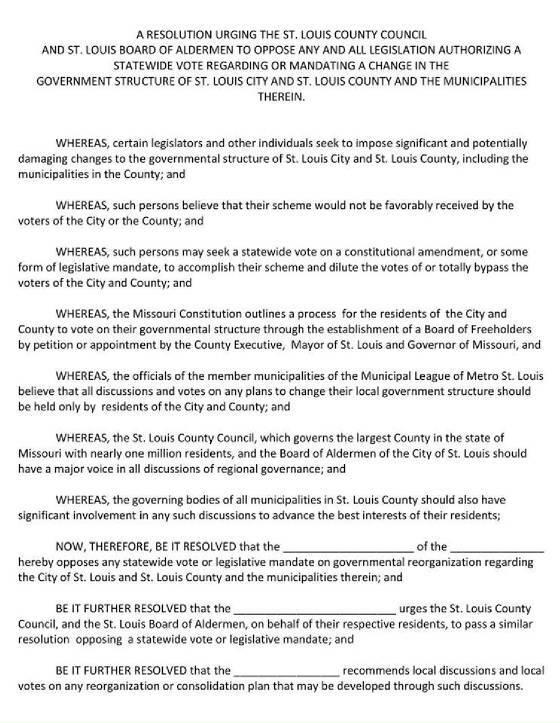 Which means that even if Stenger was to be removed from office before the Amendment were to pass, he would still be the 1st Mayor of the New Metro City. Literally the entire document gives 1st Mayor Stenger authority/final say on everything, with of course the Transition Mayor Krewson assisting in the reorganization plan of (municipal districts, the St Louis Municipal District and Fire District of St Louis Municipal District) and the Budget. Stenger also gets to appoint: All Department Heads and the Metro City Counselor/Lawyer, also he gets to Appoint 4 Deputy Mayors that will never be elected into office as well. Let’s talk about this St Louis Municipal District. This district is made up of the old entire City of St Louis. It is governed by a new 5-person board that is again Unelected but Appointed by Krewson. With ANY of its successors being Not Elected but Appointed there after by the Metro Mayor Stenger. Now the Metro Council represents 33 “Municipal Districts” these districts are made up of St Louis County Unincorporated and the 88 Municipalities. Stenger gets to pick which College will decide the borders of these Municipal Districts. Once theses districts are designed, the Council member assigned has the authority to merge the municipalities within his/her district, as their financial obligations diminish. Better Together toted that the municipalities would get to stay and run Parks, Trash and Planning and Zoning. However, the 33-person council gets final say over Zoning Matters and in many areas throughout the Amendment, it states “until the Metro City can provide”. This indicates that once the Metro City is capable of providing these services, the District Councilmember will merge all the municipalities within, thus eliminating them. The “Metro City Government” will be located within the borders of the old City of St Louis. This leaves questions on the 1% City Earnings Tax, it is supposed to be eliminated over a 10-year period, and new employees to the Metro City will get an end of year tax credit. The 1% Earning Tax will go towards the City of St Louis’s $2,000,000,000+ Billion Dollar debt. So, there is an open question then as to where the money to run their day to day services will come from and will that be from the old St Louis County’s Sales taxes? You see in order to make this work the Amendment CONFISCATES the Sales Taxes etc. of the County and its Municipalities and leaves the Municipalities with ONLY its Property Taxes and Utility taxes to Pay for its Parks, Trash and Administration of these and any remaining financial obligations, including Pensions for its remaining employees as well as the employees that the Metro City Confiscated to become their employees or terminated because they did not need them and promised the positions to run the new Metro City to all current St Louis City and St Louis County Employees. In the 70’s and 80’s Municipalities typically incorporated because they were not happy with the level of services offered by St Louis County. This is especially true of Police Services and Street Department Services, both of which the Amendment is Confiscating from the Municipalities Authority. Not to deter from the valued services of St Louis County’s Employees but there is a point when departments get too big and cannot equally service all. Most municipalities can supply their communities with “Community Policing-(officers know most of us and our needs)”, 2-minute service times, Dare Programs, SRO’s, Neighborhood Watch Programs, officers at all community events, etc. The average service times prior to incorporation were 10-20 minutes. This was felt to be too long by those who incorporated and most of us today. Our most basic rights as citizens of these United States of America are to vote in Elections for public officials. This amendment not only Eliminates our most basic right as a citizen. But further water downs our voices by allowing the entire state of Missouri to vote in it – there by giving the entire state of Missouri authority over how we are governed and the rules we must live by. Yet we do not get to Do that for them? Or will we? It will not be their Street Crews and the jobs they do for us, especially when it comes to snow removal that they will be losing. They will not have to suffer through increased crime as a result of losing ex. 5 officers on the roads 24/7 that are replaced by 1 officer on the road 24/7 because the population stats dictate that is all that’s needed. It will not be them struggling to provide the standard of Park, and Trash services we are used to due to the confiscation of our Sales Tax dollars and having to pay the Pensions of current and past and Metro City employees out of the Property Taxes and Utility Taxes we are left with. (but of course, this is meant to work towards our elimination as a city to begin with). 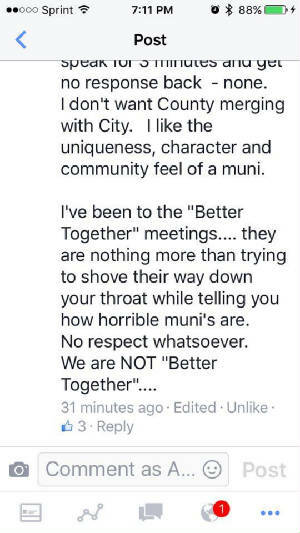 It will not be them that has to live under a Charter that we had no say in, that was set up by Stenger and Krewson and cannot be changed except by a 2/3 majority of a 33-person Council that for the 1st 5 years was handpicked by Stenger. Read the Amendment, it takes away our most basic Citizen Rights. This vote should be determined by Only the citizens of St Louis City and St Louis County. Let’s let the Board of Freeholders work as it is designed to work, in this situation. HB81 - Rep Hill out of Lake St Louis proposes legislation to limit police departments in St Louis County only. https://www.stltoday.com/news/local/columns/tony-messenger/messenger-ending-the-divided-political-year-by-finding-common-ground/article_3a950d92-082f-5f42-aed3-7545c000fc4d.html?fbclid=IwAR10codoPNr_ZIy4bKm7hr3MhileHFn9-uewGgDdVzOceMzCAqTFXkdQy6Y see the Louisville Ky paragraph. Charlie Brennan interviews Tim Fitch, Pat Kelly and Terry Jones about the merger. Audio. if you ever see this on the Ballot! Kansas City, Missouri with Eigel coming after your 1% Earnings Tax...read between the lines YOU are Next on the list! The ELITESTS of our State Government backed by Rex Sinquefields money, want to turn St Louis into a SUPER COUNTY, IE Chicago...they have no replacement plan for the $160,000,000.00 they will lose when they dissolve the 1% tax for Rex in St Louis City...so guess what that means...just like in Illinois outstate all the money from RURAL MISSOURI....will fundal through to St Louis to make up the losses and keep the new County from going bankrupt. LOOK AT BOTH BUDGETS NOW, DRIVE THE INFRASTRUCTURE OF BOTH THE CITY AND COUNTY....They are both on the verge of Bankruptcy...NOW. 2017 FBI Statistics in the City of St Louis you have a 1 in 6 chance of being a Victim of a Violent Crime. 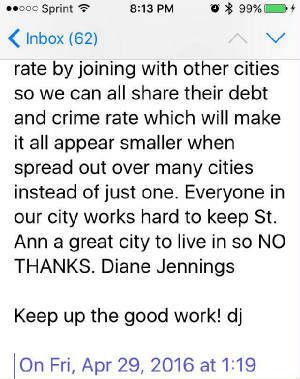 There already beginning the actions to exodus St Louis County as a result of this Better Together announcement. Can you imagine what happens to all the money the City thought they would gain if this happens? What&#8217;s left after people move with their feet? We need only to look at the city and north county to find the answer to these questions. Did big Government do anything to stop or help these areas? What will become of the Metro City without the many who move.......? Seems outside Louisville is not so happy with their merger Better Together raves about. No wonder though they are being left out and the money and services are centering around Downtown...isn't this exactly what we are worried about happening here? Indianapolis has had consolidated government since 1970. Clicking Picture above takes you to Facebook page of poster. Listen here for more info on the City County Merger where Jennifer Bird explains many of the facts. 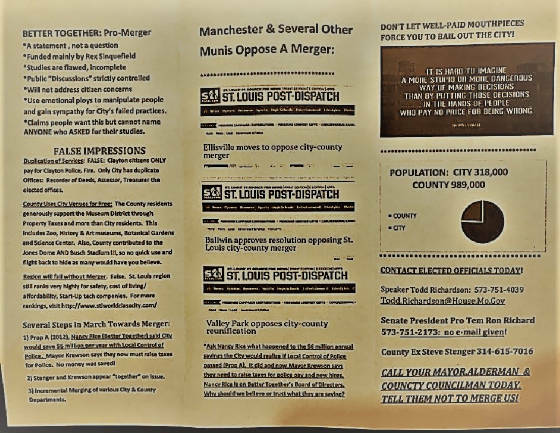 As seen here in this CitiesStrong Study done by an UMSL Professor, Better Together leaves information and data collection out of their work if it does not prove their agenda to be correct. In the case of Indianapolis they left out a half a million dollars into the summary, likely because if it had been included it would show that we actually save money through Municipal Governing. Same video as link above. Better Together shows Northwest Crossings as Barren just dirt piles, while really one month later Menards Opened it Doors and the grass in the same area they show...is GREEN. Better Together is FAKE NEWS and they are not afraid to use inaccurate info to spread their message to get their way. 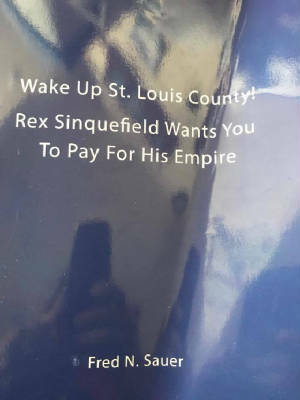 Rex Sinquefield at it again, yet we are suppose to believe that Better Together ie combining the City of St Louis with St Louis County is for the good of the citizens????? 1st off more police not less. The police have a stranglehold on them. This gives the criminals free reign and has as you can now as evidenced created an atmosphere of chaos and increased criminal activity. In terms of the traffic laws what we are witnessing now also is increased accidents, increased speeders, increased kids and adults being hit by cars, etc and yes even in the City of St Louis on Natural Bridge you have an Alderman that wants to write more tickets because the speeding has gotten so bad…yet wasn’t sb5 to prevent such calls of action? The results are hurting people and businesses. People, all people need rules, laws, set expectations whatever you want to call it. Kids need em, teens need em, adults need em. How many people do you know that say hey let’s go to the city for lunch, dinner, dancing? Or hey let’s take the metro link it’s quicker and we don’t have to pay for parking? What stops people from going downtown also stops businesses from locating there - CRIME! For the business its 2-fold. Crime hurts them and prevents them from seeing customer potential! One of the businesses we won over was based on an interview with our Chief, crime and protecting their employees was their number 1 goal. Fix crime fix regional perception. We are losing young people because we cannot attract jobs! Get them jobs n they will stay and attract more. Give them a safe community with great schools n they will stay. How many people do you know that would put their kids in a city school by choice? You might say St Louis has many things for the young, but we have a generation that is looking for walkable everything, and while downtown has baseball and concerts, and is far more walkable than the County, that’s about it. For everything else its not even spread out throughout the county…it’s all in Chesterfield. It does not mean fix crime by merging the city with the county so that the number of residents to divide the crime by is increased to 1.3 million thus giving the appearance of less crime! THIS DOES NOT MAKE PEOPLE ANY SAFER, just gives them false security until they become the VICTIM. Maintain property codes, no one wants to live next to a dump. Reduce Alderman and Mayor’s salaries. the average city salary is way above County’s average. FIX THE CITY INFRASTRUCTURE, why on earth was their no maintenance plan set up for this? Have you driven downtown lately? They don’t even snow plow residential streets at all, making it difficult for both business and residents to get to work and get employees to work. Get rid of the 1% tax it’s the most abused tax I have run across. The city actually uses this to attract businesses by allowing them to use their employees 1% for infrastructure needs, wow the employees pay for the business’s infrastructure? (just one ex I was given). The 1% Prevents people from living and wanting to work in the city and the only businesses that like it are the ones who get to use it to fix their infrastructure. Btw on their employees backs- bad anyway you look at it. Do not privatize the airport, when Puerto Rico did that it bankrupted them. Instead drop the landing fees from $80,000/ landing to 25% under nearest hub cities. This would bring in more flights, maybe hubs and lower ticket costs for customers a win, win for all! Once the city makes the necessary Government Structural changes and begins the process of not living beyond its means…. But the truth of is ... the bigger the government becomes the more likely the opinions of the people it serves will matter. J Messmer said it best in his post comments...Louisville, Indianapolis, Nashville all....ignored the people and did what they wanted to do anyway. 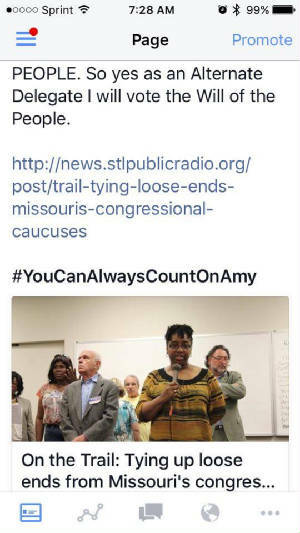 St Louis County is merely a Municipality, it is equal in authority to that of the Municipalities under the State of Missouri and its likely one of the reasons when we hear Better Together quote Municipal numbers which keep changing i.e. 91-90-92. Better Together and a few others seem to not be able to keep any of their numbers straight. Certainly, in the case of my City, they get very little right! 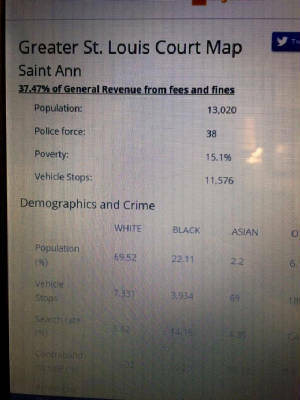 Take for example Better Together has stated that in 2013 the City of St Ann collected 37.47% of its revenue in Court Fine revenue. The inference is made and repeated by some local politicians who have taken millions in contributions from Better Together Mega Backer Rex Sinqfield is that it all came from petty “minor” traffic violations and somehow violated state law. The Missouri State Auditor disagrees with Better Together’s calculations and concluded that 27.8% was the number and was below the amount authorized by state law. The state auditors also gave the St. Ann Court a GOOD ranking on our accounting/court practices which is the second highest ranking given. Additionally, conveniently left out of Better Together’s “narrative” was the context in which the tickets that resulted in this revenue were written. In 2013 the City was in middle of a partnership with the Missouri Department of Transportation to lower the number of accidents on I-70 that were a result of speeding. This effort started in 2010 and by 2013 serious accidents on St. Ann’s portion of I-70 went from 143 in 2009 to 11 by the end of 2013. Revenue generated by these tickets was used to pay for the overtime for police officers enforcement efforts. It was and still is used for paying for School Resource\DARE Officers in Ritenour and Pattonville schools… including 2 at Ritenour High. 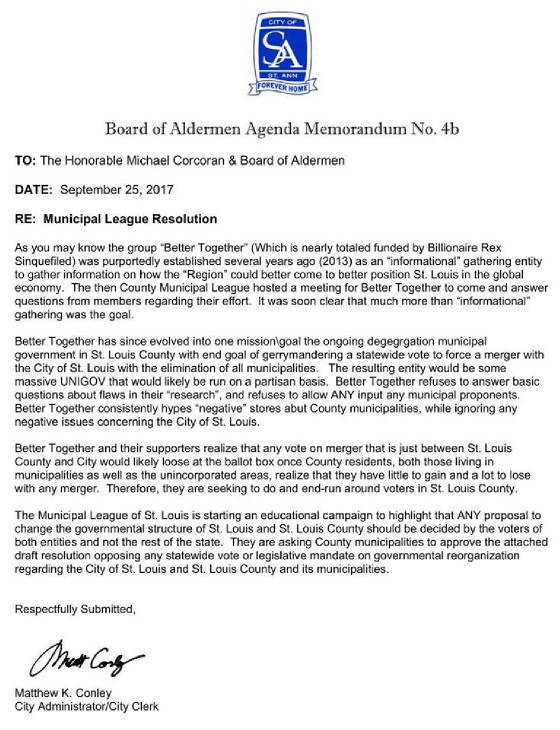 Better Together fails to note that in Oct. of 2011 our Board of Alderman took steps to reduce its own government by voting to eliminate and entire Ward, reducing St Ann’s Alderman from 10 to 8 and using the extra dollars to reestablish the St Ann Newsletter, so we could better communicate with our residents. And prior to that in April of 2010 the Board of Alderman voted to reduce its income from $475 to $375 per month. Presumably, according to Better Together, I make $9000.00/year in their report. ---Sure, wish someone would find that extra $4500.00 for me, it would have come in handy. Better Together’s claim that creation of a uni gov brought growth to Indianapolis is very questionable. Just this past July we learned that Indiana did not see business growth till 2013 when they elected a new Governor, who cut taxes. My first experience with Better Together was a few of years ago at my Airport Township meeting. The more I learned about it, the less I liked. I informed my City Administrator but not sure he really believed at the time it would get this far. I believe that the best Governing is done closest to the people. The idea of getting rid of 90 x let’s say 8 immediate voices of the people and reducing that number to 7-9 is scary enough but to then know through personal experience that listening will be the last thing on our County Councils mind…I fathom the possibilities. 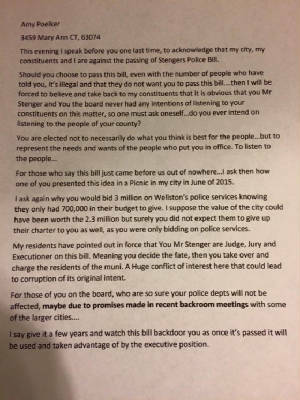 Remember neither I nor quite a few of my residents received a reply from our Councilman on the Stengers Police Bill issue. For me to get a response I had to let him know that I would let 13,000 constituents know that he was not responding to their Alderman through a direct mail newsletter. I have been attending County meetings since October 2015, one time the Council actually told a guy that the Public Speaking portion of their meeting was not to answer questions but just to allow the public to speak. So, with this in mind let’s get back to Better Together. My 1st eye opener to their agenda was through the Police Study. My City Administrator and I attended the Des Peres meeting where I watched the speaker consistently try to lead the facts of the publics responses to his questions to ensure the answers fit his agenda. I knew he didn’t care to listen, when I approached him after the meeting to stop in and have a chat with my Chief, in St Ann we prefer to elect our Chief, this way he is beholding to the people versus the Mayor. He never did stop by. Later they held a meeting at Bridgeton’s Community Center here the same type of leading the answers took place but he met with great opposition to his cause here by both St Ann and Bridgeton residents. Still their study persists on showing that people would benefit from a combined City/County Merger. My City Admin, now a bit wearier worked with a group called My Town-Our Country. We now know them as Cities Strong. 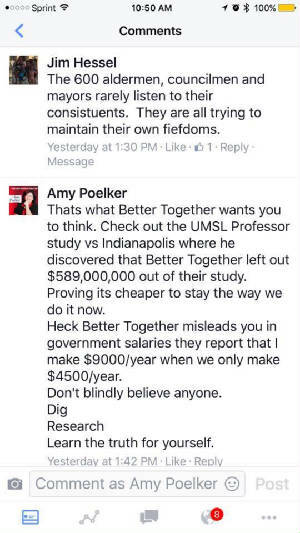 Cities Strong had an UMSL Professor do a separate unpaid study which showed $589 million dollars had been left out of Better Together’s Indianapolis versus St Louis study proving it is actually cheaper to maintain our current system of governing. This study can be found on my website as well. In July we learned that Indiana did not see business growth till 2013 when they elected a new Governor, who cut taxes. So Better Together’s claim that creation of a uni gov brought growth to Indianapolis is again questionable. I also attended reporter Craig Cheatum’s Special Meeting, most certainly the agenda became clear here and began to identify those who were involved. It is politics folks…just check your candidate’s contribution lists. Should you choose to visit my website I have a page dedicated to – The City/County Merger with links to a few studies, my personal views, resident comments and some answers I have placed on comments or questions posed to me to date in my campaign. I put together a Facebook Poll which reflected overall that 84% of those that took it were against Better Together. I am currently polling St Louis City and St Louis County residents….to date it shows 66% Against. As I knock on doors it is a topic I bring up, the people barely know what this is, and it is very important that we ensure they truly understand the ultimate goals of this group. In my conversations I have not spoken to a resident of a Municipality yet that would prefer to lose their present form of government. Most praise the various programs the munis present, love their Police Forces and those with Fire Departments love them as well. None however are aware that the School Districts are also at risk as the ultimate goal of combining the city and county does include the schools as well. The goal is like that of the Chicago School District…you know the one that is 70 million dollars in debt. Personally, I see no benefit for anyone in Better Together except maybe for Rex Sinquefield whose reasoning for pushing this upon us is to rid the City of its 1% Earnings Tax and possibly save its Bond Rating so he and his well-off buddies don’t lose a mint should they become Junk Bonds which very well could happen if the City does not take hold of their expenses. Rex has gained ground through the media stations he owns and we see the frequent pushes of misleading data to brainwash the public into believing this rhetoric. I fear Rex is winning the game on this topic, as those that govern seem to fear informing the public on this topic and of course that is tripled by Better Together’s call out that governments would indeed do just that to keep our little fiefdoms. An informed public can make better decisions. It’s one of the reasons I get the message out while knocking on doors. And its Better Together’s greatest fear. Though I am not saying that every municipality will survive, I am saying its survival should be decided by its residents and not someone who projects they know better for us. Jobs are the answer, to our issues in society today people need to feel independent to have hope, a reason to go to school, Jobs in North County have been neglected for 3 decades. The City Government and County Government has failed their North sides and now they want everyone in the County to bail them out. Currently it is $150.00 Cheaper/person to live in St Louis County than it is to live in St Charles. $45.00 Cheaper to live in St Louis vs Indianapolis. Don’t let the Propaganda fool you read up for yourselves. I want to take a moment to fill you in on a meeting I attended on Feb 9, 2015 at the Bridgeton Community Center. The meeting was run by representatives of Better Together. Their topic of discussion was supposed to be specifically related to just “Policing in the St Louis Region”. The gentleman who ran the discussion was brought in from the Washington, D.C. area. I mention this simply because I feel people in different areas of the United States have different expectations and different views of how things should be done, then we do here in St. Louis County and in Missouri. For that matter even within St. Louis County there are variations on how we desire things being done. 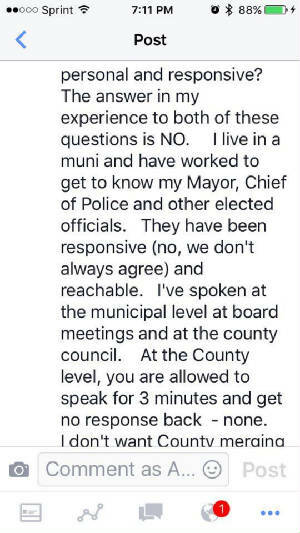 For example, most of the municipalities have gone with an appointed Chief of Police, yet St Ann and Eureka residents prefer to Elect our Chief of Police and we have indeed spoke out against changing this system by a vote of the people, I think even as recently as within the last 10 years. I find that our 90 municipal systems here in St Louis County are similar to the setup of the States of the United States of America to begin with. In the U.S. each state is an embodiment of its own. Able to make its own laws, etc. The U. S. was set up in this fashion so that if you did not like how one state was run, you had a choice to move to another one. Here I feel the 90 municipalities may have done the same thing and apparently it started along the railroad lines. The people of those municipalities did not like how they were being governed, so they set up their own, and this is how St Louis County grew after St. Louis City said, hey we don’t want to take on the financial burden of developing all that land...sewers, roads, gas lines, electric, lights, water, etc.… Do it yourself! Then likely as the states became one at a time, so did the development of each municipality, one at a time. This meeting spent most of its time discussing the fact that Bridgeton and St Ann, like/prefer the system they live within and do not want to be forced into the Better Together Scheme and that if specifically, with our police departments, Better Together needs to know how they could “fix the whole” it should be by exampling our Police Forces, our City Administration and our Community involvement and efforts to be involved and stay vibrant communities. 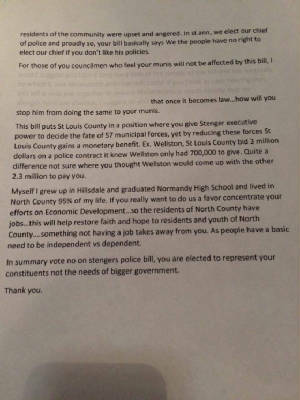 However, the Washington D C guy kept trying to push the negativity of having so many departments. Look to how Bridgeton survived when St Louis City took 2500 homes and 400 businesses to expand an Airport that still has not met as of yet, the expectation of its expansion. Look to St Ann who slowly lost one of the Largest Malls in the United States from the early 90’s till finally the last store closed, I think in 2007/08. The majority of which had been finished by 2002/03 and sat vacant. Proud we are, and this was not acceptable for us, thus since 2011 we have seen a revitalization of our small city and its great mall. Now reopening as, “The Crossings at Northwest”. The only difference between the two cities - one fell victim to the Grand Plans of St. Louis City and the other victim to a changing economy. Both cities fought their way back through the involvement and hard work of those who reside in the communities. In my personal opinion, it’s because we believed in our community and were not willing to accept defeat. I could be wrong and I am sure everyone has their own opinion, this is just mine. Now to the meeting, the presenter did a much better job in this one of trying to keep the topic of Policing in the St Louis Region at the top of our discussion. In the Des Peres meeting he could not stay on topic and pushed elimination of the police departments and the municipalities. There were maybe one or two that were not happy with their police departments, from other cities, in the room. The speaker kept insinuating that other police departments had lower wages like ten dollars an hour and no training, no expectations in hiring like college degree or time equivalent to be an officer, no citizen oversight as if all the municipalities are run this way. St. Ann and Bridgeton are not run that way. As a matter of fact I have been to most of the municipal meetings in District 2 and have not found any departments, run this way. The expectations of the crowd were that Better Together devise a way to aid those areas that need guidance, without affecting those municipalities that are on the right track or just plain happy with how things are going. However, this is not the goal of Better Together. 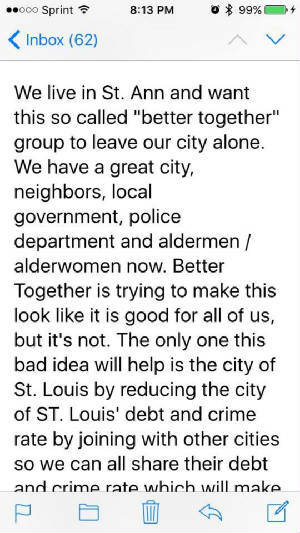 Better Together’s goal is the Elimination of the 90 Municipal Governments and to combine the County with the City of St Louis. Now let’s put this in perspective. The City of St. Louis has a Billion Dollar Budget yet their infrastructure i.e. ; streets, sidewalks buildings have not been taken care of. Crime is up in my opinion because they need more police, yet do not budget for them. The city has 28 Alderman making 35,000/year and a Mayor making ?? ?, with this I have to ask Why? Imagine the Car insurance rates and Home insurance rates do you think they will go up or down. Will home values go up or down? Taxes to correct these things, up or down? Years ago the City did not want to build the infrastructure of the County, but now expect the County to solve their over spending and lack of maintenance and foresight. 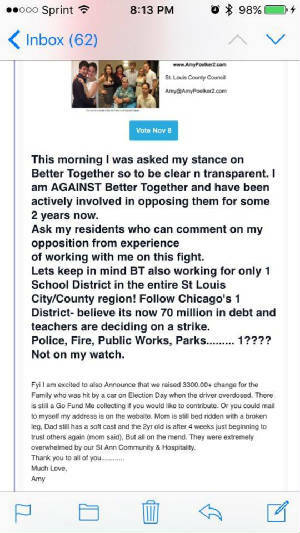 Better Together would also mean ONE SCHOOL DISTRICT like Chicago. So No Lafayette, No Pattonville, No Parkway, No Ritenour, No Hazelwood etc.…Did you know the Chicago School District is 70 Million Dollars in Debt currently and the Teachers are about to strike because they cannot get a raise even with all this over spending? One Police Department, both County and the City have already shown us that safety is not tops on their list, if it were they would put more emphasis in the budget on the Police Department so they could proactively police versus reactively police. In reactive policing the crime has already happened and the citizen is already a victim. One Fire Department, here I do not know a lot about how these districts are set up, St Ann shares two Departments within its boundaries. Though I can’t imagine what costs may be initially incurred to ensure every location had the same equipment. One Planning and Zoning Department. This department is the department that does the occupancy inspections and home inspections. It is also the department that aids in Economic Development. Here St Louis County has already shown us for the last 30 years that they only care to develop anything South of Olive Road for that matter even the State shows us this with the condition that both Page and St Charles Rock Road are in. Even the very reason 7 cities were asked to Police Highway 70 is because they did not opt to fix the crowning and curving issues of Highway 70 in front of the Airport. And for the Record the reason the Highway Patrol can’t do it is because there are only 4 cars scheduled per shift from here to Rolla, Mo. We see this happening again in Wentzville, Mo., where a new Double Fine Zone has been established. This Link has list of Sponsors/Donors of Better Together on the right of this page. http://www.bettertogetherstl.com/donate Do we really want Big Business, deciding how we want to live? Bigger Government NOT a good idea…Currently most municipalities have in place 2 representatives of the community in each of the wards that you can reach by phone or email and these representatives will help you fight city hall or understand city hall. With bigger Government I ask…HOW OFTEN DO YOU TALK TO YOUR - STATE REP, OR STATE SENATE REP. HOW OFTEN DO YOU TALK WITH YOUR FEDERAL SENATORS OR CONGRESSMEN? ….OR DO YOU GET THE STANDARDIZED EMAIL? BIG GOVERNMENT EQUALS NO VOICE FOR THE PEOPLE….Who will care about our needs, Your needs, Ferguson’s needs, Fenton’s needs, Creve Coeur’s needs……etc.? 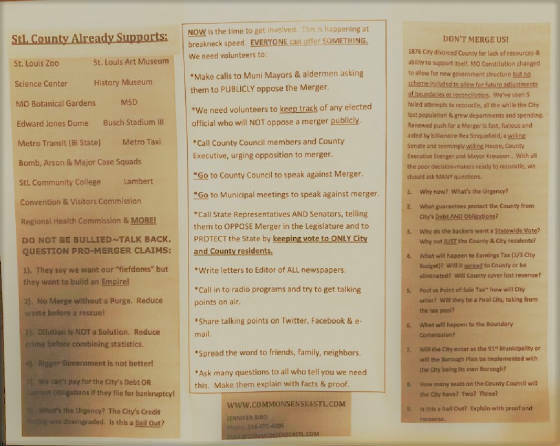 I already know that my County Councilman did not respond to my email till I threatened to put in a Newsletter to 13,000 residents that he did not respond to their Alderman. I also know that many of my residents have still never received a response from our County Councilman. I see NO BENEFIT for the residents, TO LOSE THEIR VOICE and let BIG GOVERNMENT takeover, which DOES NOT FEEL THE NEED TO RESPOND TO THE NEEDS OF “WE THE PEOPLE”. Nor Listen to US. So yes I Am Against Better Together because I prefer to have smaller governments where I can actually give em a call and express my opinions…and they listen. So Louisville merged in 2003. They should be in pretty good shape by now than right? times each of the 4 years she was there. One bridge no Biggy right? you would find in Downtown St Louis. Volleyball Tournaments looks just like Downtown St Louis there as well. area and I have to ask what were they spending their money on? It certainly was not their infrastructure. as the Government in place taking care of it. County at one point was not going to approve it. become more reliant on it with their Billion-dollar budget. that the rams were leaving no matter what. 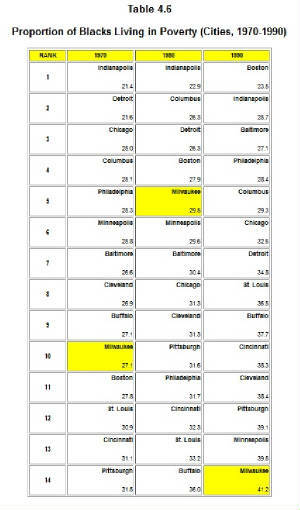 DC and Boston know better than us St Louisans? What we want or need??? 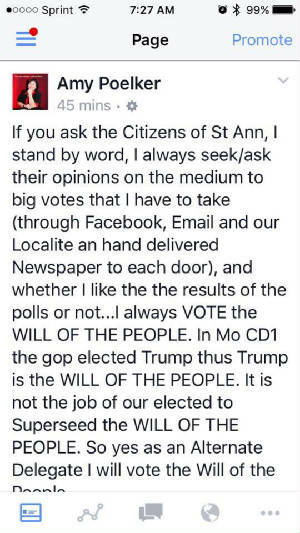 Owner at Amy Poelker Ward 2 St. Ann, Mo. One has to wonder what the true motives are behind his persistence in this ordinance. He has already been told its not constitutional, yet he feels the need to waste more taxpayer dollars in an appeal. Will his board support him in this effort? There were only 2 County Council Members who recognized this bill was unconstitutional and they are Mark Harder and Hazel Erby. In my view the County Council seems to NOT be listening to their constituents. As a matter of fact in one meeting they told a speaker that the public speaking session was for the public to express their concerns and not for the Council to address/answer their questions. 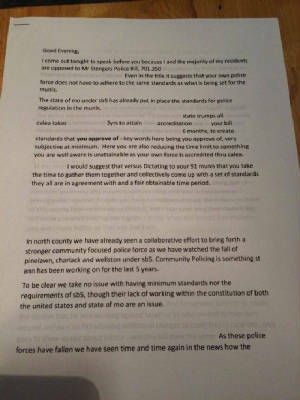 Before this Police Bill passed through the Council there were 3 letters of support written and placed in add on Agenda the day of that Council meeting. 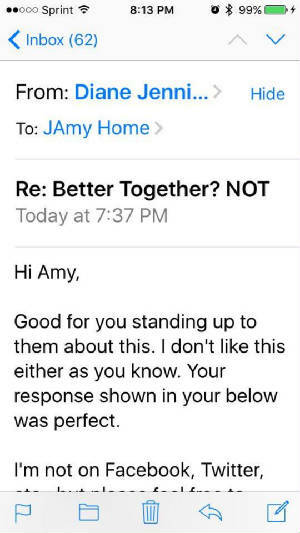 What those 3 letters did not reveal in their support is that they were all Board Members of Better Together. This at minimum suggests that Better Together has some influence is the decisions of the County Council. I wonder if they remember they are suppose to be working for the people and not Mandating to the people. This is only one of many bills that appear to be heading in the mandating direction. Michael Duke That's a mighty white horse your riding, but I prefer facts over fiction and the facts have never been printed nor shown by the media on St Ann. Sure we are an easy target with the guys on the highway. But when i got in office i called modot myself and they assured me that our boys would not be on that highway if they had not approved it because its their responsibility to make sure they are safe out there as well. Now will they admit this after Sen Schmitt decided to earn his donation money from Rex and present a media campaign that would further his career in the Proven Unconstitutional SB5 Bill? Of course not. But Mr Schmitt needed to get his name out statewide now didn't he, so that name recognition would be enough to get people to check his box in Nov. Pretty smart idea if he had done it constitutionally it may have worked. may still work as long as everyone wants to believe its the munis fault that people speed 71-102 mph, its definitely the munis fault when we dont have a license, or insurance. Why i bet its even the munis fault when they get caught speeding and have drugs on em right? The real meat of SB5 was put together by the municipal mayors and administrators. Here lies the best part of the bill, you see the biggest issue with the tickets was that every ticket was a criminal offense therefore if the person did not show up for court it was the law that a warrant must be written on it. The munis suggested that tickets 4 points and under become civil offenses then the warrant need not be assigned...moral to the story the State Legislature had it within their power for decades to change this and never thought about it. 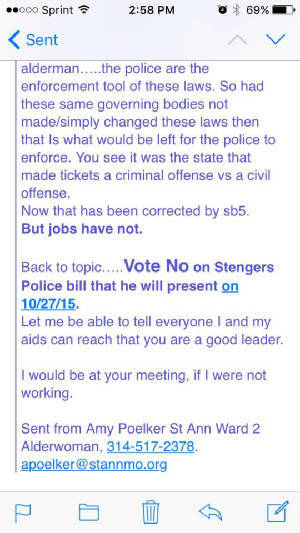 So Stenger decides he wants to jump on this bandwagon why who knows better together, greed, power? But just as Unconstitutionally again Proven. Now i will ask you what i asked him. 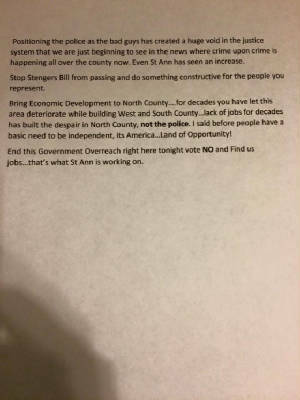 While St Louis County built the south and west what were they thinking when they just watched all of the jobs leave north county and did nothing for 3 decades to change the tide. Did they think people would not lose hope with no jobs around? People have a basic need to be independent but how can you be independent with no where to make a decent living. Even when we found a developer for Northwest Plaza, County did not want to approve the tiff to make it happen. The Govenor held onto the tax credits till this past fall holding up the development. What favors do you think Senator Schmitt is doing to the St Louis Region especially the North Region when he goes out to the Wall Street Journal to push his hype, especially after Ferguson. I still love the video Cheatum used in the mist of all the media attention to make St Ann look like we were desperate and needed the money badly from the highway. The video he used was 2 years old and failed to show the Menards and green grass at the time.He couldn't have chosen to get a little even for his sons ticket, right? It had to all be so true, cops are evil they are not there to protect your 16 year old daughter from getting killed in a car accident by someone who for whatever reason decided it was ok to break the law. People who believe everything the media puts out there, they are the ones who scare me. Michael Duke To be clear I would be happy if the money went to Ritenour and Pattonville School Districts. This state program is interesting in itself. It has existed for years yet my kids superintendent had no clue that it was a possible revenue source. Hmmm The city in the last 5 years I have been in office did not double its budget and the program was approved in 2010, the mall failed in 2007/2008. The money made on the highway was utilized to run the enforcement of the program, remaining went back into the schools through restarting the DARE program at Drummond, Hoech and Holy Trinity and increasing the SRO program in Hoech. We also took on the SRO duties of Ritenour High School whose boundaries are not within our borders. 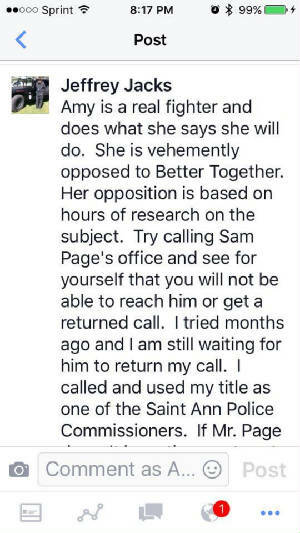 I would sing our praises there but you have already predecided what St Ann PD is all about, so if you care to find out the truth just call the Superintendent or Principal or ask a teacher at the high school. Fights are down and the last time we took our dog through the school the only trace of drugs in the school was an odor of marijuanna on one jacket in one locker out of 900 lockers. As far as the double fine signs go, our city street department does not have the authority to take those signs down only modot can do that, and to my knowledge as we were told the double fines ended but the traffic enforcement contiued. 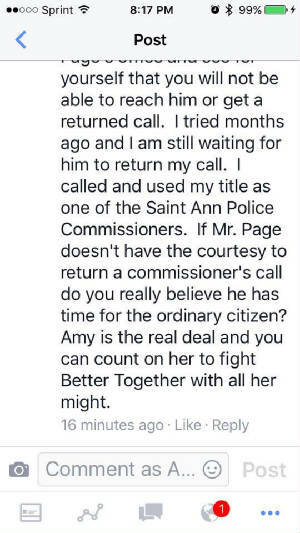 Now St Ann is unique in that we Elect our Police Chief so in order for him to keep his job he must please the citizens and not just a Mayor, so I guess next April we will see how our citizens feel about the job he has been doing. As far as when I called Modot it was in 2011 after I got in office, so this would have been a couple of years before the fine change. Its extremely easy to be judgemental when you do not have all the facts presented before you, the post dispatch, senator schmitt, cheatum they were all given the facts but chose not to report them since it did not fit their agendas. Even our court audit, they were happy to report we were being audited but failed to ensure the general public knew that we received a GOOD on the report. 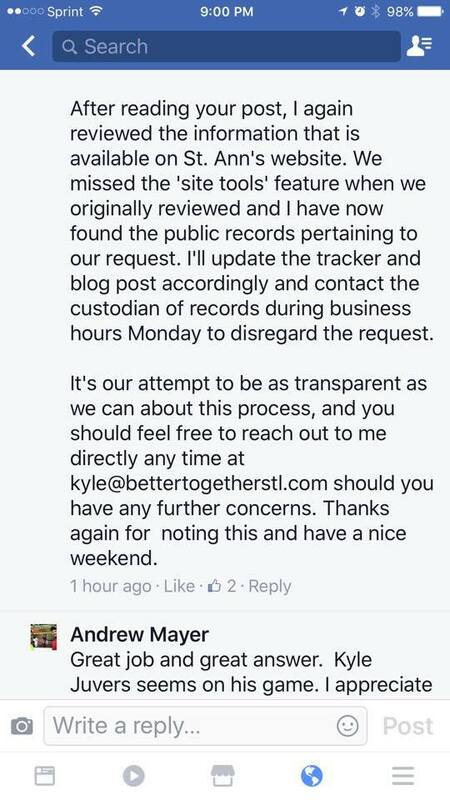 Oh and this was after someone at state told the auditors to come back and check because no way could we be allowed to keep the EXCELLENT that they originally reported back to their bosses with. You choose to believe that enforcement of state written laws is the answer to our societal problems, I choose to believe it lies in the hands of those who write the laws. You see I was a Restaurant Manager for 23 years and when my kids were unable to come to work because of a warrant they got caught up in for one silly reason or another, I had to replace them or take their place most often on those shifts while they moved from jail to jail Muni, County, City of St Louis. So if you were listening above It was the Municipal Governments that ended this nightmare for people by inserting into sb5 the Minimum Standards the most important of those being to make the 4 point or less tickets a civil offense versus a criminal offense thus ending the requirement of a warrant on lesser ticketed violations. Frankly I appreciate your debate as it has allowed me to put the truth in print for people to read if they so choose. As far as the 90 muni issue I believe that through the elimination of the munis for this Rex paid better together agenda would eliminate the voice of the people. The bigger the government the less voice we really have, proven when our County Councilman chose not to listen or even respond to my residents nor myself about this Police Bill. of course after I sent a second email for response that let him know I would inform my 13000 residents through a newsletter sent to every home and business that he would not respond to their representative, then I got my response but my residents never did get a response. The County Council needs to be responsive the their constituents and accountable. They have wasted our tax dollars more than just on this Police Bill, the Landlord Bill as well, trying to mandate Unconstitutionally to their citizens. If you cannot see through the issues with having too big of a government, continueing this debate is useless. Just remember Better Together is about not just elimination of the municipal governments but also about only having One School District like Chicago, One Police Dept, One Fire Department, One Public Works Department, One Planning/Zoning Department etc...If St Louis County Council is not listening to the people now, why should we expect that when they have all the power, they will listen then? 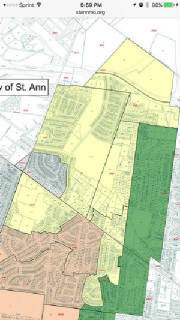 and just a BTW St Ann has never been at risk as a result of SB5 nor Stenger's Bill and I am not saying that every muni should exist, but am saying that it should be the decision of the people within the boundaries of the city to make and not those who think they know better. The only thing Ferguson proved is there is big money in paid protesting. Bring jobs to North County and City, this will make a difference. John Kohler We have always had 5-6 cars on our city streets, our citizens have never gone unprotected. Thats why I said above the majority of the dollars taken in were spent on enforcement of the program in overtime, added court costs, paying reserve officers, vehicle needs etc. what was not spent on this was indeed reinvested in the 3 schools within and not within our boundaries. I can only give you the facts, i cannot make you believe them. You could sit down with my chief and city admin to discuss it or sunshine request the facts. Thanx and btw I did try to turn it into a scholarship fund for the districts however apparently the state frowns upon using tax payer dollars in this manner. John Kohler The mo hwy patrol has i am told 4 cars from here to Rolla. Personally I would be happy to relinquish management to the highway patrol. When accidents occur on the highway our guys have to go up there to manage traffic till highway patrol can get there. This practice does indeed cost the citizens of st ann not only labor and equipment costs but also leaves them unprotected on our city streets. I believe the board in place when this was put in place in 2010 had this in mind, as that year there were 108 accidents in st ann's location of the highway that took our guys off of our city streets. Possibly the Governor should consider investing more money in the protection of our highways, it would be well served so that hwy 70's Drug runner reputation could have a dent put in it as well. Maybe then we could put a dent in the Heroin problems of St Louis County. Maybe then one of our nations heros would not have overdosed and run over a Family of 3 walking on our city sidewalks on Election Day. For that matter St Louis County should do the same restructure their budget to not only properly pay their officers and correction officers but put more cars on the roads. 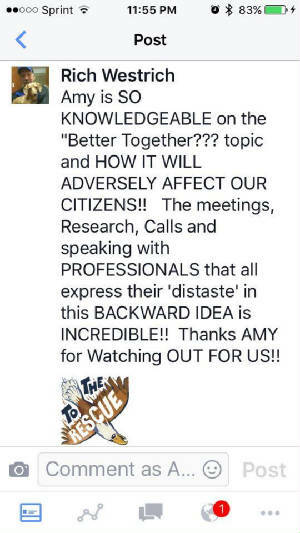 At the Des Peres Better Together meeting there was a woman who lives in Eureka, she stated that she decided she needed a ccw because her police unit could not get to her home any faster than 25 minutes. This is due to stlc only scheduling one car from Twin Oaks to Eureka. The Eureka chief of Police was at this meeting, i did confirm. He stated they do keep an eye on her but she is right her home is in unincorporated stlc. As far as the bad PR goes..people started that long ago with the fall of Northwest Plaza. I have lived in North County 95% of my lifetime not in fear. My kids both graduated from Ritenour HS 4.1 and 3.6 one a teacher, one studying to be a Psychologist at UMSL. They played Club Volleyball most of the tournaments are in the south and west. For some reason they fear people from north county and actually would tell us to go back to north county where our theiving butts belonged. Pretty sure our CreveCoeur parents and the rest of us took that as an indication that our area has bad PR, this was way before the highway enforcement. I understand people dont like it, get the state to budget more enforcement and i am all for it. But if a 16 year old dies up there because we all want to speed and not be held accountable for our actions. I cannot live with that. This one is the least accusatory comment that I responded to, NOTE I do respond to my Constituents good or bad news. So where do minimum police standards lie? Is this really a bad thing or just a bad political thing? 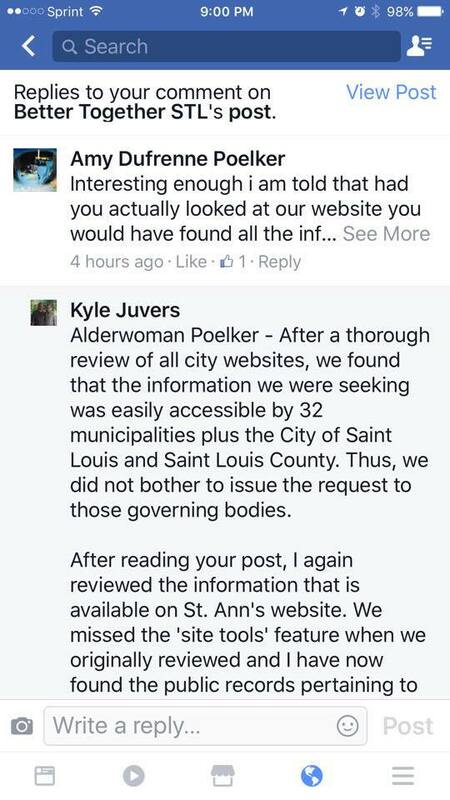 Are the requirements too egregious or just that they originated with Stenger? 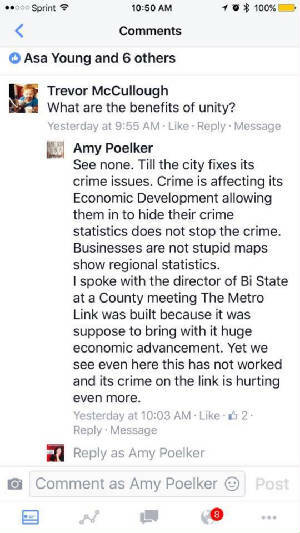 If members of each city came to their respective city halls and demanded this, would the likes of Amy Poelker turn them away? The minimum standards in sb5 were created by the municipal mayors, administrators and police chiefs and given to Speaker of the house Diehl to put into the bill. when sb5 left the senate floor it only cared that st louis county munis got 10% and rest of state including st louis city and unincorporated st louis county got 20%. This did nothing to fix the real issue of the warrants from city to county to state. Stengers Bill was about reducing the states 6 years to make it happen to 6 months, which to CALEA certify a minimum of 3 years is required to meet. This was a money grab plain and simple. Example: What took Wellston 700,000 to Police the city, St Louis County bid 3 Million on the job to do, knowing Wellston did not have the funds to pay for this. 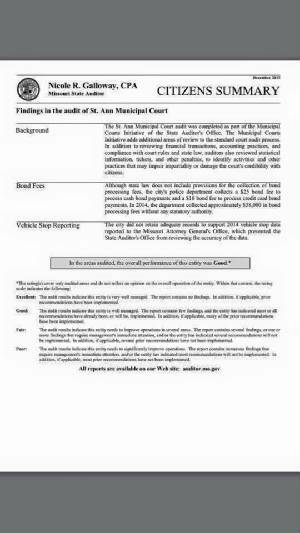 So where did St Louis County think Wellston was going to come up with the money to Pay this 3 Million??? Again as stated above not saying some munis should not combine services but am saying it should happen by a vote of its citizens and not because someone has decided its best for them. Better Together STL What year are you referring to? Amy Poelker considering the fact that there were no specifications for what dollars accounted for revenue until after aug 2015. The audit is for 2014 where without those specifications known we still came in at 25% and of course koster's report is for 2015 which just came out via one of your own posts. if your misstatements have been based on prior years than 14 or 15, i would like to see all the data that was used to determine these numbers considering no specifications were available to determine till after aug 2015 when sb5 passed into law. prior to aug 2013 if i recall, the percent was 35% allowed then in aug it dropped to 30 where it stayed till aug of 2015. then of course we all know now that the 12.5 % for munis only in stl county while unincorporated and stl city and the rest of the state got 20% has been ruled UNCONSTITUTIONAL. aside from this and the Hancock violation, sb5 is a good bill. Though i was not in office when the Highway detail was put enforce, I was at the meeting when it was discussed. Modot did ask the cities to reduce accidents by speed control just as they have recently asked Wentzville to do the same on 70 now. I also called Modot myself when when I got in office and they assured me my guys would not be up there unless they oked it because they are responsible for the safety of everyone on the highways. should you wish to discuss speed cameras and red light cameras......now they cost car counts on roads and hurt businesses. looking at Kosters report our city is not the number 1,2,3, or 4 in ticket writing even within the district of county we are part of. and if you compare the district of county that we are in your claims of pulling over a certain population don't wash either, for the entire district. St Ann and I have worked together for the last 5 1/2 years, looking back at where we started, and seeing where we are now….it’s happening in St. Ann! We are clearly on our way to and economic recovery. 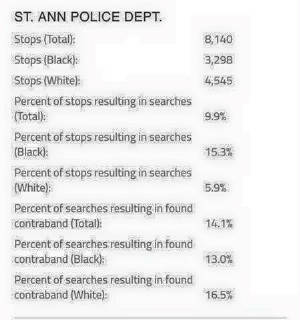 Congratulations, St. Ann…all your hard work is paying off…. 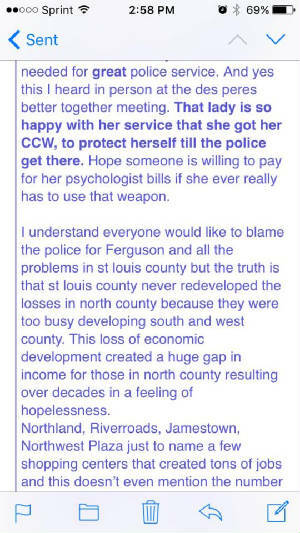 St Louis County - I hope I can gain your support and the support of others, in my work towards the future. I will aggressively work with both parties to push thru the success of the entire region...it must happen NOW, this next election is very important to District 2 and St Louis County. I have been an Alderman for the City of St Ann for the last 5.5 years. Today I come before you because I am running for the St Louis County Council District 2 seat.
. 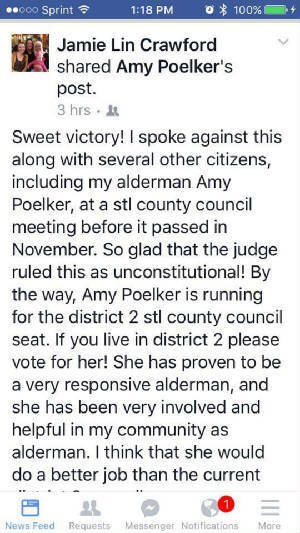 The job of the St Louis County Councilman is no different than the job of an Alderman, just a larger population to serve. You see the County is merely a Municipality, it is equal in authority to that of the Municipalities under the State of Missouri and its likely one of the reasons when we hear Better Together quote Municipal numbers which keep changing i.e. 91-90-92. Better Together and a few others seem to not be able to keep any of their numbers straight. Certainly in the case of my City, they get very little right! 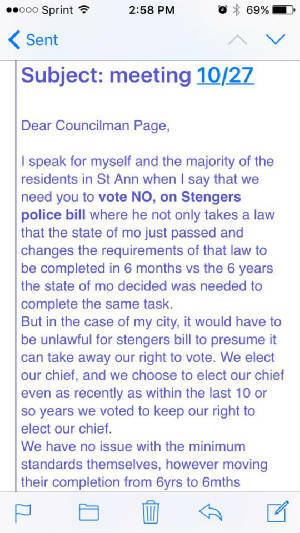 Better Together fails to note that in Oct. of 2011 our Board of Alderman took steps to reduce its own government by voting to eliminate and entire Ward, reducing St Ann’s Alderman from 10 to 8 and using the extra dollars to reestablish the St Ann Newsletter, so we could better communicate with our residents. And prior to that in April of 2010 the Board of Alderman voted to reduce its income from $475 to $375 per month. Presumably, according to Better Together, I make $9000.00/year. Sure wish someone would find that extra $4500.00 for me, it would have come in handy on this campaign. Better Together’s claim that creation of a uni gov brought growth to Indianapolis is very questionable. Just this past July we learned that Indiana did not see business growth till 2013 when they elected a new Governor, who cut taxes. So Better Together’s inability to put out correct information reflects irresponsibility on their part and the part of their sponsors. My first experience with Better Together was a couple of years ago at my Airport Township meeting. I have been attending County meetings since October, one time the Council actually told a guy that the Public Speaking portion of their meeting was not to answer questions but just to allow the public to speak. So with this in mind let’s get back to Better Together. My 1st eye opener to their agenda was through the Police Study. My City Administrator and I attended the Des Peres meeting where I watched the speaker consistently try to lead the facts of the publics responses to his questions to ensure the answers fit his agenda. 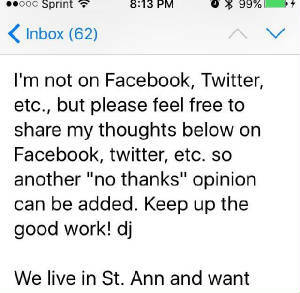 I knew he didn’t care to listen, when I approached him after the meeting to stop in and have a chat with my Chief, in St Ann we prefer to elect our Chief, this way he is beholding to the people versus the Mayor. He never did stop by. My City Admin, now a bit wearier worked with a group called My Town-Our Country. We now know them as Cities Strong. 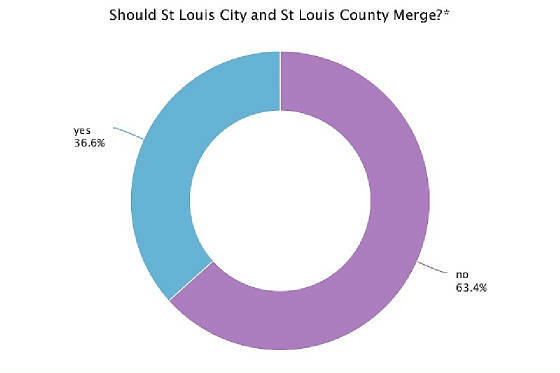 Cities Strong had an UMSL Professor do a separate study which showed $589 million dollars had been left out of Better Together’s Indianapolis versus St Louis study proving it is actually cheaper to maintain our current system of governing. This study can be found on my website as well. In July we learned that Indiana did not see business growth till 2013 when they elected a new Governor, who cut taxes. So Better Together’s claim that creation of a uni gov brought growth to Indianapolis is again questionable. Should you choose to visit my website I have a page dedicated to - Against Better Together with links to a few studies, my personal views, resident comments and some answers I have placed on comments or questions posed to me to date in my campaign. I put together a Facebook Poll which reflected overall that 84% of those that took it were against Better Together. None however are aware that the School Districts are also at risk as the ultimate goal of combining the city and county does include the schools as well. The goal is similar to that of the Chicago School District…you know the one that is 70 million dollars in debt. Personally I see no benefit for anyone in Better Together except maybe for Rex Sinquefield whose reasoning for pushing this upon us is to rid the City of its 1% Earnings Tax which the people of the city just voted again to keep in place. Rex has gained ground through the media he owns and we see the frequent pushes of misleading data to brainwash the general public into believing his rhetoric. I fear Rex is winning the game on this topic, as those that govern seem to fear informing the public on this topic and of course that is tripled by Better Together’s call out that governments would indeed do just that to keep our little fiefdoms. An informed public can make better decisions. It’s one of the reasons I get the message out while knocking on doors. Jobs are the answer, people need to feel independent to have hope, a reason to go to school, Jobs in North County have been neglected for 3 decades. A VOTE FOR AMY IS A VOTE TO PREVENT “BETTER TOGETHER”, if you prefer “Better Together” vote for my opponent, he will vote that through for you. 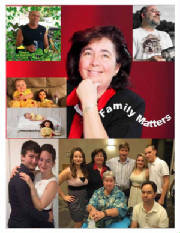 From: Diane Jennings (leeanddianeathome@gmail.com) You moved this message to its current location. See below for my responses to your survey. I can mail the form in with all my responses (that form will show an X on the ones that I agree with and the box will be left blank on the one's that I don't agree with) if that works better for you if you email me your address. As an fyi for this listing of how I voted, I've put an X in front of each one that I agree with and "Disagree" in front of the one's that I don't agree with. X I live in a Municipality and prefer to live in a Municipality. 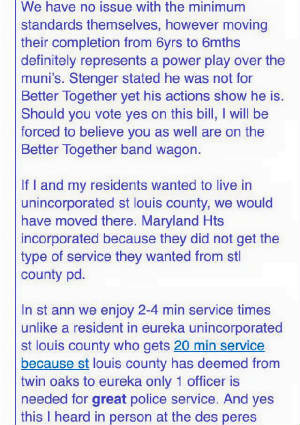 X I prefer St. Louis County leave Municipal Government decisions to their residents. 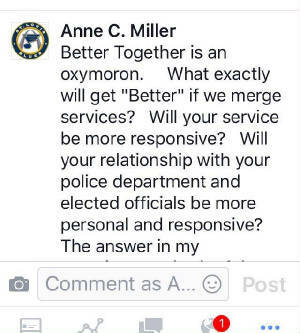 X Better Together could have a negative impact on services currently provided by Municipal Governments. X Better Together would hide crime and not fix the problem. 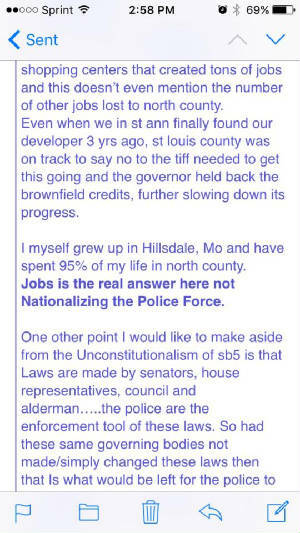 X I live in Unincorporated St. Louis County and prefer to live in unincorporated St. Louis County. "Disagree": I prefer St. Louis County to eliminate the Municipal Governments. "Disagree": Better Together is good for St. Louis Region. "Disagree": Better Together would reduce crime. This was my 1st email to our County Council Person. 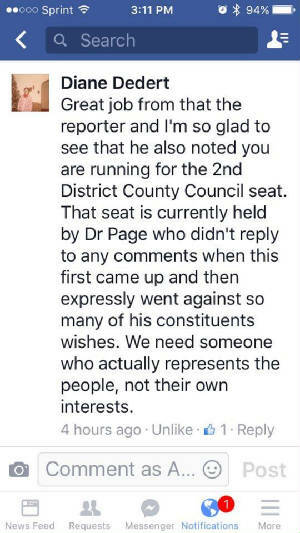 There was no response till a week later when I explained that if he did not respond to my email requests that I would indeed put in a newsletter that is mailed to every household and business, to 13,000 residents that their County Council Person did not even answer their Alderman. There were an additional 15-30 other residents that had told me they emailed their council person with NO RESPONSE either. He sido un Concejal de la Ciudad de St Ann desde hace 5,5 años. Hoy me presento ante ustedes porque me postulo para el asiento del Condado de San Luis Distrito Consejo 2.
. El trabajo del Condado de San Luis Concejal no es diferente que el trabajo de un concejal, sólo una población más grande para servir. Usted ve el Condado no es más que un Municipio, es igual en autoridad a la de los municipios en el marco del Estado de Missouri y su probable una de las razones cuando oímos mejor juntos citamos números municipales que mantienen a cambiar es decir, 91-90-92. Mejor juntos y algunos otros parecen no ser capaces de mantener cualquiera de sus números recta. Ciertamente, en el caso de mi ciudad, que reciben muy poco a la derecha! Tomemos, por ejemplo, mejor juntos ha declarado que en 2013 la Ciudad de St Ann recogido 37,47% de sus ingresos en ingresos Fine Corte. La inferencia se hace y se repitió por algunos políticos locales que han tomado millones de dólares en contribuciones de mejor juntos Mega Backer Rex Sinqfield es que todos ellos procedentes de violaciónes de tráfico menores "menores" y la ley del estado de alguna manera violado. El auditor del estado de Missouri no está de acuerdo con los cálculos del Mejor juntos y llegó a la conclusión de que el 27,8% era el número y estaba por debajo de la cantidad autorizada por la ley estatal. Los auditores del Estado también dieron el corte de St. Ann una buena clasificación en nuestras prácticas de contabilidad / corte que es el segundo más alto rango dado. Además, convenientemente dejado fuera de la "narrativa" Better Together fue el contexto en el que fueron escritas las entradas que dieron lugar a estos ingresos. En 2013, la ciudad estaba en medio de una asociación con el Departamento de Transporte de Missouri para reducir el número de accidentes en la I-70 que fueron el resultado de exceso de velocidad. Este esfuerzo se inició en 2010 y 2013 por los accidentes graves en la parte de la I-70 de Santa Ana pasaron de 143 en 2009 y el 11 a finales de 2013. Los ingresos generados por estas entradas se utilizó para pagar el tiempo extra para los esfuerzos de aplicación de los agentes de policía. Fue y todavía se utiliza para el pago de la Escuela de Recursos \ DARE en las escuelas oficiales de Ritenour y Pattonville ... incluyendo 2 en Ritenour alta. Mejor falla Junto tener en cuenta que en oct de 2011 nuestro Consejo de Alderman tomó medidas para reducir su propio gobierno votando para eliminar y toda la sala, lo que reduce el Concejal de St Ann de 10 a 8 y el uso de los dólares extra para restablecer el St Ann Newsletter, para que pudiéramos comunicar mejor con nuestros residentes. Y antes de que en abril de 2010 el Consejo de Alderman votó para reducir sus ingresos de $ 475 a $ 375 por mes. Es de suponer que, de acuerdo con la mejor juntos, hago $ 9.000,00 / año. Seguro deseo que alguien encontraría ese extra de $ 4,500.00 para mí, habría muy útil en esta campaña. Junto mejor reclamo de que la creación de un gov uni trajo un crecimiento de Indianápolis es muy cuestionable. Sólo en julio pasado aprendimos que Indiana no vio el crecimiento del negocio hasta 2013, cuando eligieron a un nuevo gobernador, que redujo los impuestos. Por lo tanto la incapacidad de Mejor Juntos para apagar información correcta refleja la irresponsabilidad de su parte y por parte de sus patrocinadores. Mi primera experiencia con mejor juntos fue hace un par de años en mi reunión Aeropuerto municipio. Cuanto más aprendía sobre ello, menos me gustaba. He informado a mi administrador de la ciudad, pero no estoy seguro de que él realmente creía en el momento en que llegaría tan lejos. Creo que la mejor de Administración se hace más cercano a la gente. La idea de deshacerse de 90 x digamos 8 voces inmediatas de la población y reducir ese número a 7-9 es bastante miedo, pero a continuación, sabe por experiencia personal que escucha será la última cosa en nuestra mente Consejos de Condado ... Me sondear las posibilidades. Recuerde que ni yo ni unos cuantos de mis residentes recibieron una respuesta de nuestra Concejal en el tema Bill Stengers Policía. Para que consiga una respuesta que tenía que hacerle saber que iba a dejar que 13.000 electores saben que él no estaba respondiendo a su Alderman a través de un boletín de correo directo. He estado asistiendo a las reuniones del condado desde octubre, una vez que el Consejo dijo en realidad un chico que la porción de hablar en público de su reunión no iba a responder a las preguntas, pero sólo para que el público pueda hablar. Así que con esto en mente volvamos al mejor juntos. Mi 1er abridor de ojos para su agenda era a través del Estudio de Policía. Mi administrador de la ciudad y yo asistimos a la reunión Des Peres donde vi el altavoz tratar constantemente para llevar a los hechos de las respuestas públicas para sus preguntas para asegurar las respuestas encajan su agenda. Yo sabía que no le importaba a escuchar, cuando me acerqué a él después de la reunión para parar y tener una charla con mi jefe, en St Ann preferimos elegir a nuestro Jefe, de esta manera él está contemplando a la gente frente a la Alcaldía. Nunca se detuvo por. Más tarde se llevó a cabo una reunión en el Centro Comunitario de Bridgeton aquí el mismo tipo de líder en las respuestas tuvieron lugar pero se encontraron con una gran oposición a su causa aquí por los residentes de St Ann y Bridgeton. Aún persiste en su estudio que muestra que las personas se beneficiarían de un combinado de la ciudad / condado de concentraciones. Mi ciudad de administración, ahora un poco más cansado trabajó con un grupo llamado Mi-Town nuestro país. Ahora los conocemos como ciudades fortificadas. Ciudades fuertes tenían un profesor UMSL hacer un estudio independiente que mostraron $ 589 millones de dólares se habían quedado fuera de mejor juntos es Indianápolis frente a St Louis estudio demostrando que es en realidad más barato para mantener nuestro sistema actual de gobierno. Este estudio se puede encontrar en mi sitio web también. En julio nos enteramos de que Indiana no vio el crecimiento del negocio hasta 2013, cuando eligieron a un nuevo gobernador, que redujo los impuestos. Así reivindicación Better Together que la creación de un gov uni trajo un crecimiento de Indianápolis es más cuestionable. También asistió a la reunión especial del reportero Craig Cheatum, con toda seguridad la agenda quedó claro aquí y empezó a identificar a aquellos que estuvieron involucrados. Es gente de la política ... Sólo tienes que comprobar las listas de cotización de su candidato. En caso de que optar por visitar mi sitio Web tengo una página dedicada a - Contra Mejor Juntos con enlaces a algunos estudios, mis puntos de vista personales, comentarios residentes y algunas respuestas que he colocado en los comentarios o las preguntas que yo hasta la fecha en mi campaña. Redacté una encuesta que reflejaba Facebook general que el 84% de los que tuvieron que estaban en contra de mejor juntos. Como ya llamar a las puertas es un tema que aparezca, la gente apenas sabe lo que es esto, y es muy importante que nos aseguramos de que realmente entienden los objetivos últimos de este grupo. En mis conversaciones no he hablado con un residente de un municipio hasta ahora de que preferiría perder su forma actual de gobierno. La mayoría alaban los distintos programas de los munis presentes, aman a sus fuerzas de policía y los cuerpos de bomberos con los aman también. Ninguno sin embargo, son conscientes de que los distritos escolares también están en riesgo ya que el objetivo último de la combinación de la ciudad y el condado no incluyen las escuelas. El objetivo es similar a la del distrito escolar de Chicago ... ya sabes el que es de 70 millones de dólares en deuda. Personalmente veo ningún beneficio para cualquier persona en mejor juntos excepto quizás por Rex Sinquefield cuyo razonamiento para empujar esta sobre nosotros es librar a la ciudad de sus ganancias del impuesto 1%, lo que la gente de la ciudad acaba de votar de nuevo para mantener en su lugar. Rex ha ganado terreno a través de los medios que posee y vemos los empujes frecuentes de datos engañosos para lavar el cerebro al público en general en la creencia de su retórica. Temo Rex está ganando el juego en este tema, como las que gobiernan parecen temer informar al público sobre este tema y, por supuesto, que se triplicaron por la llamada a cabo Better Together que los gobiernos de hecho hacer eso para mantener a nuestros pequeños feudos. Un público informado puede tomar mejores decisiones. Es una de las razones por las que sale el mensaje, mientras que tocar puertas. Aunque no estoy diciendo que cada municipio va a sobrevivir, estoy diciendo que su supervivencia debe ser decidido por sus residentes y no alguien que los proyectos que ellos saben mejor para nosotros. Los trabajos son la respuesta, la gente necesita sentirse independiente para tener esperanza, una razón para ir a la escuela, puestos de trabajo en el Condado del Norte se han descuidado durante 3 décadas. Ejecutar nuestro Condado debe ser de "trabajar por el pueblo, para que el Condado de San Luis un ambiente agradable fuerte y de negocios, lo que proporciona puestos de trabajo para la gente de San Luis Condado -Norte, Sur, Este y Oeste mientras que ayuda a mantener nuestro Escuelas del Condado fuerte, a nuestros ciudadanos, nuestra infraestructura fuerte, y la prestación de servicios necesarios para las personas. " UN VOTO PARA AMY es un voto para impedir la "Mejor juntos", si lo prefiere "Mejor Juntos" votar por mi oponente, que va a votar que a través de usted.